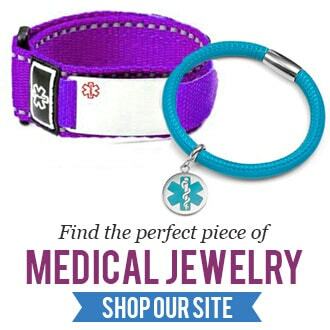 You don’t have to pay top dollar for quality medical alert bracelets! StickyJ Medical ID carries a great collection of medical ID’s for under $20! Keep reading below for five choices in expensive medical bracelets you’ll love to wear. $19.99Camilla Heart Charm Medical Bracelet – Perfect for everyday looks – wear it to the office, or during a date night out with the hubby! There’s room to engrave your medical safety details on the back part of the heart charm. $19.99Rocky Rubber Medical Alert Bracelet – Next in line is this black rubber and steel medical ID bracelet for just 19.99. It has an edgy look that’s comfortable. It’s black plated medical tag can be engraved front and back with laser which appears as a white/silver tone. $19.99Black Cotton Medical ID Bracelet – If you’re looking for comfort first, this adjustable cotton strap medical bracelet is one of the best options for you. $15Logan Hemp Rust Rope Medical Bracelet – Rustic, casual safety that’s only $15, you can’t beat that! This adjustable medical alert bracelet is made with leather and hemp. It can be engraved on the front and back with your safety information. $14.99Girls Heart Medical Bracelet – If your child needs a medical alert bracelet, but you’d rather not spend tons of money on it, because she’s growing and active, then this surgical grade stainless steel medical ID is a solid choice for her. It comes with a heart pendant with a pink medical symbol. It fits wrist sizes 4 to 4.5 inches. For many more affordable choices in medical alert bracelets, visit StickyJ.com anytime and browse collections of jewelry for men, women, and children. If you need an ID for a specific condition such as Diabetes or Alzheimer’s disease, the specific conditions page can is set up with those custom bracelets already in mind. Cute Kids ID Jewelry for Year-Round Safety!